DiskBoss Ultimate and DiskBoss Server provide a built-in file integrity monitor allowing one to save digital signatures of critical system files and then periodically monitor the integrity of critical system files, detect unauthorized changes, export HTML, text, Excel CSV or XML reports and send E-Mail notifications. In addition to the file integrity monitoring capabilities available in the DiskBoss GUI application, DiskBoss provides a command line utility allowing one to verify the integrity of critical system files, save reports and send E-Mail notifications from shell scripts and batch files. Finally, DiskBoss Server, which runs in the background as a service, allows one to continuously monitor the integrity of system files in critical servers and NAS storage system. The DiskBoss file integrity monitor verifies the integrity of critical file system files by comparing a reference file system state with the current file system state including verification of digital signatures of critical system files, creation and last modification dates, attributes, file ownership information, etc. In order to be able to perform the verification process, the user needs to create a file integrity monitoring command, specify disks or directories that should be monitored, types of files that should be monitored and types of changes that should be detected. First of all, let's create a new file integrity monitoring command. 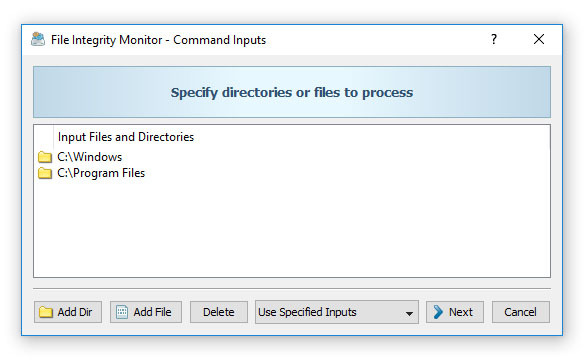 On the user-defined commands dialog or the commands tool pane, select the 'Add New' menu item and select the 'File Integrity Monitoring Command' menu item. On the command name dialog, enter a unique command name and press the 'Ok' button. If you need to monitor the system disk on a critical server, add the 'Windows' directory and the 'Program Files' directory. In addition, on a 64-Bit server, add the 'Program Files (x86)' directory. Once finished adding input directories, press the 'Next' button. 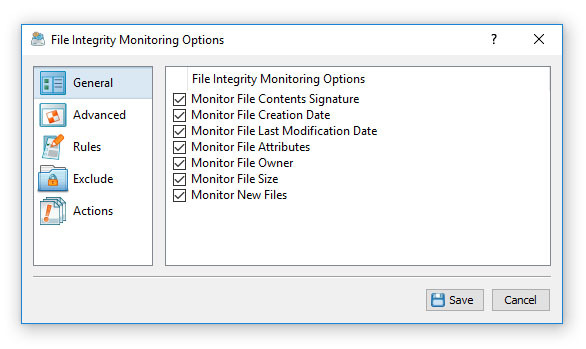 On the file integrity monitoring options dialog, select the 'General' tab and select/unselect types of changes that should be detected. By default, the DiskBoss file integrity monitor detects all types of changes and usually there is no need to change the default configuration. Now, select the 'Rules' tab and add one or more file matching rules specifying types of files that should be monitored. If no rules are added on this tab, the DiskBoss file integrity monitor will verify all types of files. If one or more file matching rules are specified, the DiskBoss file integrity monitor, will verify files matching the specified rules and skip all other types of files. In the simplest case, just add a single file matching rule named 'Programs, Extensions and Script Files', which will match all types of programs, executable files, DLL libraries, batch files, various types of scripts, etc. For a more advanced configuration, consider adding Windows configuration files and security files. In order to simplify the configuration process, DiskBoss provides a logically organized hierarchy of file types allowing one to easily select required file categories. In total, DiskBoss is capable of automatically recognizing more than 2,500 file types and categories making it very easy to select the types of files which should be monitored. During runtime, DiskBoss will categorize and classify file detected in the input disks and directories, verify files matching the specified rules and report all the detected file system changes. Once finished adding file matching rules, press the 'Save' button to save the file integrity monitoring command. 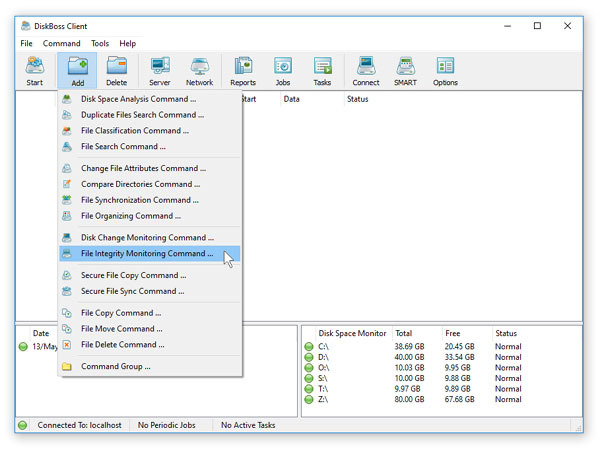 Each time a file integrity monitoring command is saved, DiskBoss will show a confirmation message asking the user to confirm whether the command's settings and the file system state should be updated or the user wish to save just the command's configuration settings without updating the file system state file. In general, if the user has changed input disks or directories, file matching rules or exclude directories, the file system state should be updated and the user needs to press the 'Yes' button. On the other hand, if the user has modified types of changes that should be detected and/or actions that should be executed when one or more changes are detected, there is no need to update the file system state file and the user can press the 'No' button. 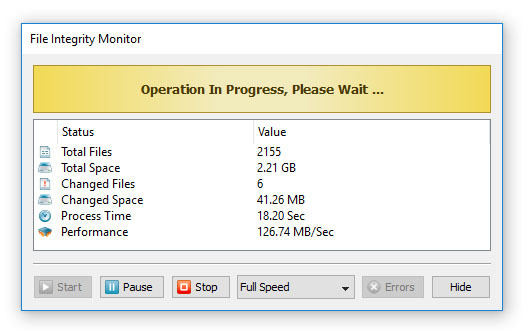 During the file system state update process, DiskBoss will display the process dialog showing the amount of processed disk space, the number of processed files and the current status. If you need to temporary pause the operation, press the 'Pause' button. Press the 'Continue' button, to resume the update operation. Wait for the file system state update process to complete and once the operation is finished, press the 'Close' button. In order to manually verify critical system files, just click on the required file integrity monitoring command in the user-defined commands tool pane. 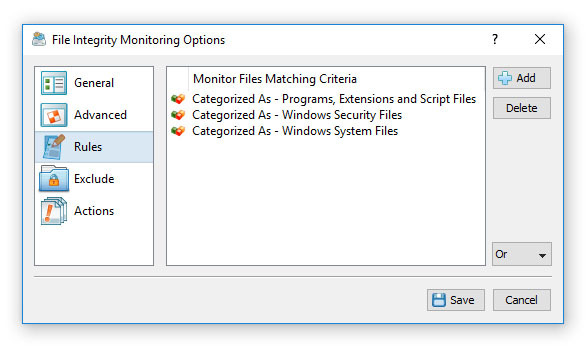 Another option is to create a desktop shortcut for the file integrity monitoring command and to execute the command directly from the Windows desktop. During the verification process the process dialog shows the verification status, the number of verified files, the number of detected changes, the verification performance and the process time. In order to temporary pause the verification process, press the 'Pause' button. Press the 'Continue' button to resume a previously paused verification operation. 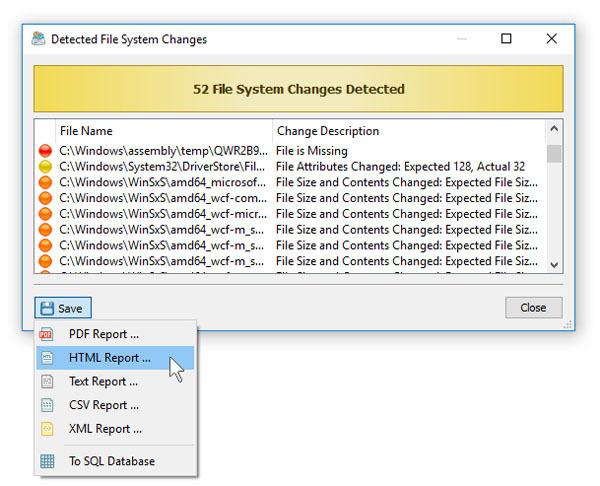 If one or more file system changes will be detected, the file integrity monitor will display the change list dialog showing all the detected file system changes and allowing one to review detected file system changes and export reports. 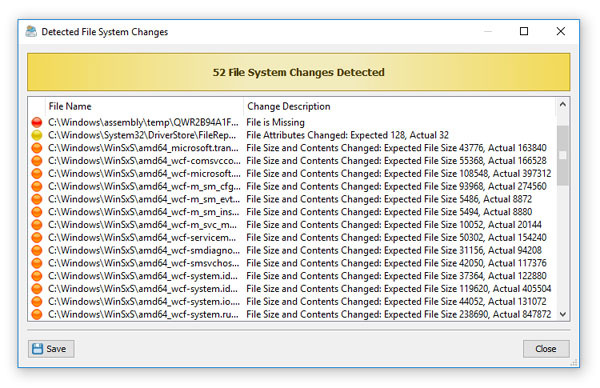 For each detected file system change, the file integrity monitor displays the full name of the changed file and a change description explaining what exactly has been changed in each specific file. The DiskBoss file integrity monitor allows one to export HTML, text, Excel CSV and XML report files. In order to export a report file, open the change list dialog, press the 'Save' button and select an appropriate report format. DiskBoss will open the save report dialog allowing one to select a destination directory and enter the report file name. 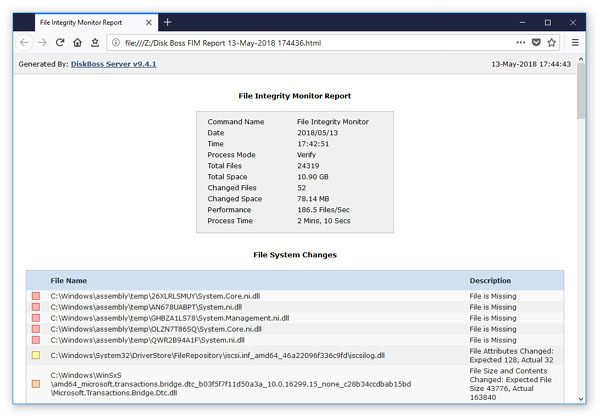 A typical file integrity monitoring report includes a report title, a summary section showing general information and a list of detected file system changes. For each detected file system change, DiskBoss shows the full name of the changed file and a description explaining what exactly has been changed in each specific file. The DiskBoss file integrity monitor allows one to save detected file system changes in an SQL database through the ODBC database interface. In order to enable database export capabilities, open the options dialog, select the 'Database' tab, enable the 'ODBC' interface and specify an ODBC data source name, user name and password that should be used to connect to the database. 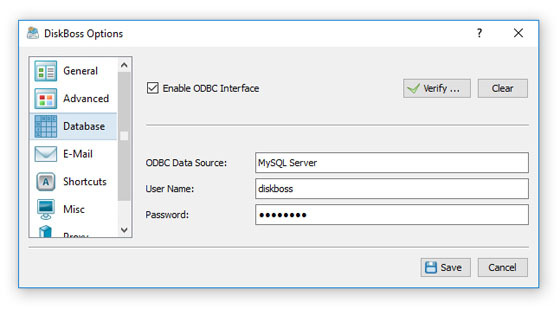 Once finished configuring the ODBC interface, press the 'Verify' button to make sure the DiskBoss file integrity monitor is capable of connecting to the database using the specified ODBC database interface. In order to manually save detected file system changes to the database, open the change list dialog, press the 'Save' button and select the 'SQL Database' menu item. In order to see reports saved in the database, just press the 'Database' button located on the main toolbar. The top part of the database dialog provides a number of report filters allowing one to filter reports by the report type, title, host name, etc. In order to open a report, just click on a report item in the reports view. The database dialog allows one to export/import reports from/to the database. Select one or more reports, press the right mouse button and select the 'Export Reports' menu item to export the selected reports. Press the right mouse button over the reports view and select the 'Import Reports' menu item to import reports to the database. 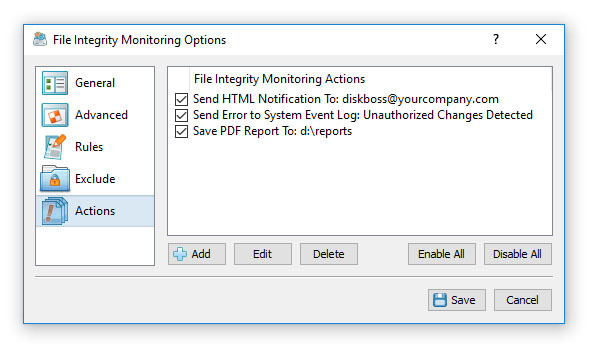 The DiskBoss file integrity monitor allows one to periodically verify critical system files, automatically detect unauthorized changes, generate reports, send E-Mail notifications and/or execute custom actions. 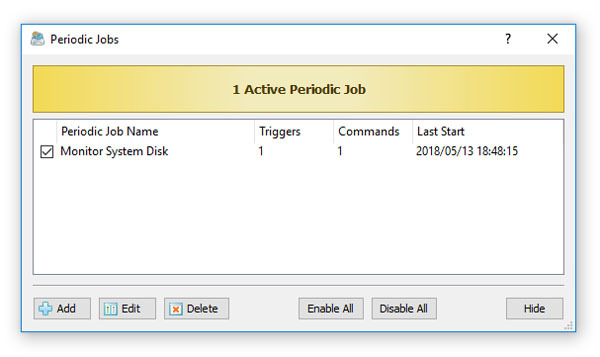 In order to execute a file integrity monitoring command periodically, open the periodic jobs dialog and press the 'Add' button to add a new periodic job. 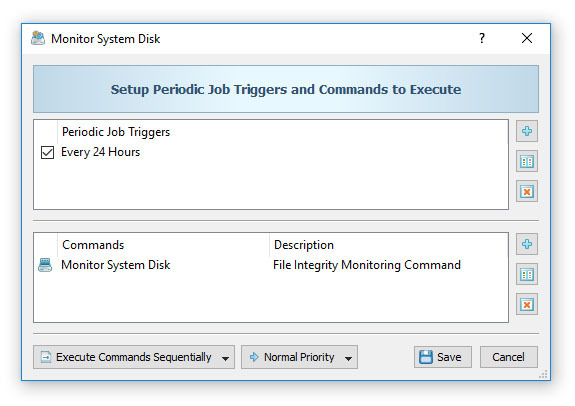 On the job dialog, select the file integrity monitoring command that should be executed and specify the required time interval. According to the selected time interval, the DiskBoss file integrity monitor will execute the specified command, verify critical system files, detect changes and optionally generate reports, send E-Mail notifications and/or execute custom commands, scripts or batch files. Important: Keep in mind that when using periodic file integrity monitoring commands in DiskBoss Ultimate, the DiskBoss main GUI application should be running. For continuously running mission critical servers, it is more appropriate to use DiskBoss Server, which runs in the background as a service and is capable of automatically verifying critical system files, generate reports and send E-Mail notifications even when no one is logged in. The DiskBoss file integrity monitor provides the ability to automatically save reports, submit reports to an SQL database, send error messages to the system event log and/or send E-Mail notifications when a user-specified number of file system changes are detected. 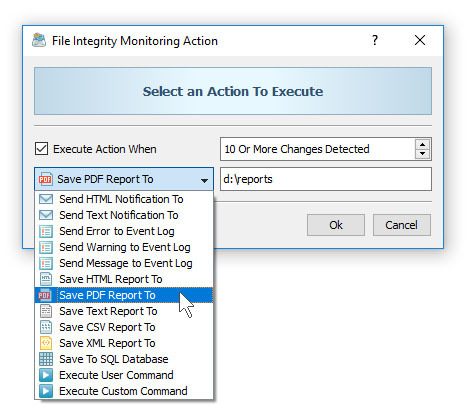 In order to add one or more file integrity monitoring actions, open the file integrity monitoring options dialog, select the 'Actions' tab and press the 'Add' button. On the action dialog, enter the number of file system changes that should trigger the action, select an appropriate action type and enter an action value. For all types of report files, the action value should be set to an existing directory where to save report files or a full file name if all reports should be saved to the same file. For E-Mail notifications, the action value should be set to the destination e-mail address. In addition, in order to be able to send E-Mail notifications, the user needs to open the options dialog, enable E-Mail notifications and specify an SMTP server to use to send E-Mail notifications. For system event log actions, the action value should specify a textual message that should be send to the system event log. For user-defined commands and custom commands, the action value should specify the name of the command to be executed. DiskBoss Server, which runs in the background as a service, is capable of operating in a fully automatic mode, periodically verifying critical system files, generating reports, sending E-Mail notifications and/or executing user custom commands, scripts or batch files. 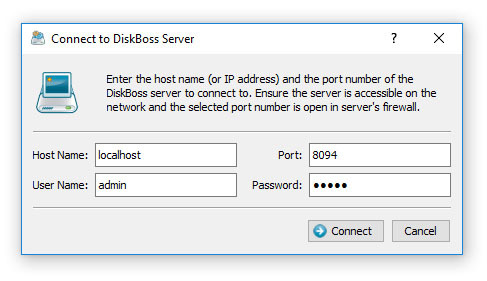 DiskBoss Server may be controlled locally or through the network using the DiskBoss client GUI application or the DiskBoss command line utility. 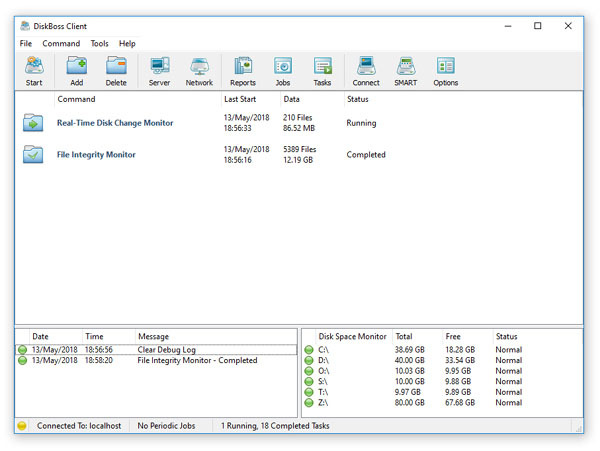 In order to configure file integrity monitoring operations, connect to DiskBoss Server using the client GUI application, add a file integrity monitoring command and configure a periodic job to execute the file integrity monitoring operation at specific time intervals. In addition to the ability to periodically verify critical system files, the user is provided with an option to setup a real-time disk change monitoring operation, which may automatically trigger verification of critical system files in real-time when a user-specified number of changes is detected in the system disk or the Windows system directory. DiskBoss Server is capable of operating in a fully automated mode, without any user intervention, continuously monitoring the system disk, detecting file system changes, saving reports and sending E-Mail notifications even when no one is logged in allowing one to use it on mission critical servers requiring a high level of protection and security.